The first look, a very important moment for the bride and groom. When the bride asked me to capture this moment at Magnolia Plantation and Gardens, we had to figure out the logistic of it all such as the time, and the perfect location to have it. 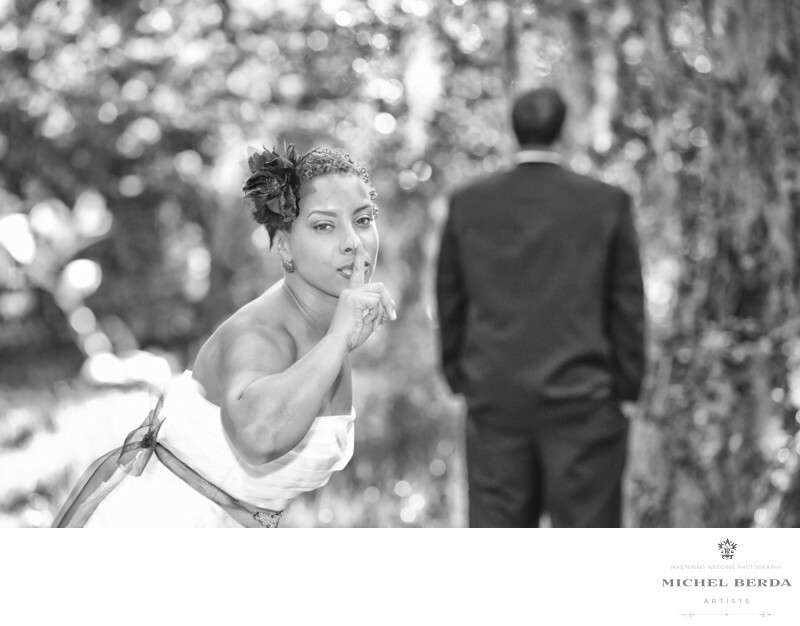 There are many amazing locations here at Magnolia Plantation and Gardens, once we found the perfect place, I asked the groom to be as calm as possible, and to not turn around, and have his back toward the bride, I knew the bride was excited and going to be so eager to get there, however she surprised me, by taking her time, while you could hardly hear her getting to him, someone made a noise by stepping on a leaf she turned around and gave this amazing look of Shhhhh by taking her finger to her mouth, a perfect wedding photograph image at Magnolia Plantation & Gardens for me, as I am always ready for anything unexpected.Keywords: Magnolia Plantation First Look Wedding (3).